I want to... see how Hope works. 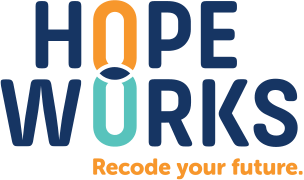 You have the power to recode your future with Hopeworks. We combine education, technology, and entrepreneurship so you can build professional web design and development skills. We partner with young men and women, ages 16 to 25, to get back in school, earn permanent jobs, and achieve their highest potential. Help us build stronger futures that will have lasting, positive impact on the communities around us. The contributions you can make to Hopeworks draw upon a full spectrum of strengths–from fundraising to community-building to mentorship. Find out how to make a difference with us. Strengthen your business and your community. We can design, manage, and maintain your website for your business or nonprofit. Youth who train with us use best practices to build professional websites that engage your online visitors and drive them toward your marketing needs. Stay connected. Our Hopeworks Alumni group is a link for those who have launched careers at different organizations and businesses. Through this group, alumni can offer support and encouragement to one another and to current Hopeworks interns. Hopeworks exists to open doors for positive change in all directions. Please be in touch so that we can find out how to strengthen our relationship with you. ©2019 Hopeworks. All rights reserved.